Skip the 2 till the end. Sarah and I live in the same area, so, I am aware of the lack of color on the trees. Usually at this time of year it's spectacular. but, it's just been too warm. Kathy, there is still not much color here in Michigan either. I think this will be one of those years where we won't see spectacular color. Pugetopolis must have the corner on fall colour this year. Everybody!! Keith was up really early!! By 6am pst at least. Thanks, everyone for your leaf-color report - it is very disappointing around here to still have trees loaded with GREEN leaves. Now I'm not even concerned about our lack of color, but it is completely weird to not have any falling yet! I keep pleading with Mother Nature to hold off on the snow until they do, but ………..not sure if she is listening tho. Enjoy your day & find a smile for something happy today! Wonder if Serena, in one of those 'Leaf-Peepers' states, is having any color? Lucky you, Wow_Axel, in Washington state! We had beautiful colours this year, but most of the leaves have fallen now. Thx for the link on FB, Peter. Fun. Did you know, Kathy, that it is possible to thumb twiddle both ways. Only the most skilled twiddlers can go both ways at the same time ... could keep your group occupied for hours. Here I am twiddling my thumb ! 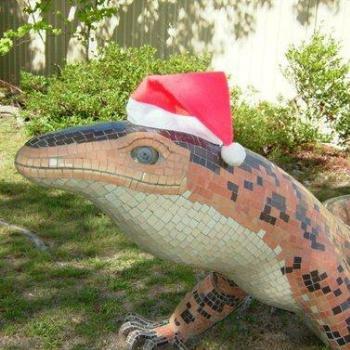 Morning all, a festive lizard. A rotten kookaburra got one of our blue tongue lizards yesterday, not happy. Suanne, Jack and LeeB . Our Zen mymare ... the sound of one thumb twiddling. It sounds similar to one hand clapping, Keith. Hello, GannieMo, long time no see! Leaves in Montreal are all colors but still on trees...must have got too much vitamin D from the hot HOT summer we had.. strong winds lost the game... No complaint has the scenery is beautiful! Finished the beer. Time for some sleep.